Why Social Responsibility is so Important to Us? From the start, Restwell has focused on being a socially responsible company that doesn’t just preach caring but rather acts upon these values in the community. As part of this commitment, we’ve adopted many things to help the environment and our community, including but not limited to our Forests for Tomorrow initiative, office recycling programs, and a belief that our manufacturing process can be fully sustainable. We are also a proud and active supporter of the Better Sleep Council. With concern for the global environment, Restwell has created product lines to minimize our carbon footprint. Restwell embraced green & sustainable business practices for no other reason than we felt we needed to. We felt we needed to because of our feeling of responsibility to help the community and world that has given us the ability to run our business. Plus, adopting these programs was really quite easy, and it gives us something to talk about with our customers when they’re looking at one of our mattresses. Increasingly, businesses are expected to find ways to be part of the solution to the world’s environmental and social problems. And although we know we can’t solve all of the problems the world has, Restwell has always felt that doing its part is important. As part of this, within everything we do, we focus on doing it in a way that causes the least harm to the environment, as well as those around us. Whether we do this in our office, or in our plant on a larger scale, every activity we do is prefaced by an understanding that we’re going to do it in a sustainable and responsible manner. Our sustainability programs are making a difference! And we’re now looking at more ways to be even more environmentally friendly! For more information, reach out to us at aidanm@restwell.com. We look forward to hearing from you! Founded in 1990, Restwell sells its product line through National Retail & Independent Dealers in North America. Restwell also has a Hospitality Sales Division which services corporate accounts across Canada. Restwell manufactures all bedding, at its state-of-the-art facility in Surrey B.C., to order through “just in time” production techniques which serves its dealers and customers more efficiently. Most bedding orders are scheduled, produced and shipped within 3 days of receipt with fast, friendly and reliable service on our dedicated trucking fleet. Think Restwell Sleep Products only does mattresses? Think again! We’re also skilled logistics people who offer shipping solutions to cities all over BC and Alberta. Born out of pure necessity, we had to find a way to promptly and effectively service our dealers throughout Western Canada, the Restwell logistics services team averages 1000 deliveries to over 90 cities EACH MONTH! We’re a great team to work with because we’re small enough that we still care about each of our individual customers, but also large & experienced enough that you can trust us to get the job done right every time! PLEASE NOTE, all of our trailers are tandem dry vans. This means that we can handle almost any size of shipment that you can throw at us. Plus, we’re already making monthly, if not weekly, trips across Western Canada, so it’s easy for us to accommodate you! Our prices are incredibly competitive! Simply put, our aim is to maximize the use of our trucks in their deliveries to offset the costs associated with operating a fleet and at the same time offer great prices and freight service to businesses within our routes and deliveries. Of course, any company can claim this, but we can prove it! We have been in business since 1990, and as part of our mattress business, we service hundreds of small independent retailers across the province. Working with them has helped us become acutely aware of what it takes to provide excellent customer service and keep all of our diverse customers happy! Founded in 1990, Restwell sells its product line through National Retail & Independent Dealers in Western Canada. Restwell manufactures all bedding, at its state-of-the-art facility in Surrey B.C., to order through “just in time” production techniques which serves its dealers and customers more efficiently. Most bedding orders are scheduled, produced and shipped within 3 days of receipt with fast, friendly and reliable service on our dedicated trucking fleet. Don’t think of a mattress as being vital to your health and well-being? Think twice, as a mattress is a key part of having a great next day! We believe that a mattress could be one of the most powerful tools you have to fight off a host of health issues including colds and flus, obesity, depression, heart disease, and other maladies. You spend almost half your day in bed, so it’s key that you’re comfortable and supported. If you’re sleeping on a mattress that’s worn out or needs to be replaced, you could be robbing yourself of restorative, restful sleep. A person may need a different mattress as they age or if they have become frail, lost or gained weight, had an injury or surgery or a medical condition such as arthritis. And as far as mattress warranties go, don’t trust them! They’re not an indicator of how long the mattress should be used before it needs replacing, in-fact some mattresses can last more than 20 years longer than the warranty without a problem. Waking up with back and or neck pain, numbness, stiffness, and aches are telltale signs it’s time to replace your mattress. Waking frequently during the night that isn’t related to sleep apnea can be a sign your mattress is preventing your body from relaxing and being able to sleep properly. Any visible sagging spots, indentations or areas on the surface of the mattress that appear or feel uneven mean it’s time to ditch your mattress. If you feel coils, rethink your mattress. Know your needs and research your mattress size and mattress type options before you head to the store to determine your individual sleep needs. Don’t be shy in the store. Kick your shoes off and lie down on several different models in various positions—including the one or two you typically sleep in. And wear comfortable clothes that allow you to lie down, roll over and move around on the bed. According to the BSC, it can take up to 15 minutes to relax enough to feel the true support of a mattress. Spending a few extra minutes in the store while shopping can spare you from committing to a mattress you don’t love. The store sales staff will push you, but don’t rush this decision because it’s important! Mattresses are sold at furniture stores, department stores, sleep specialty shops and even discount warehouse stores. The BSC suggests looking for a retailer that has a sales staff knowledgeable about brands, warranties, and benefits of the various mattresses. 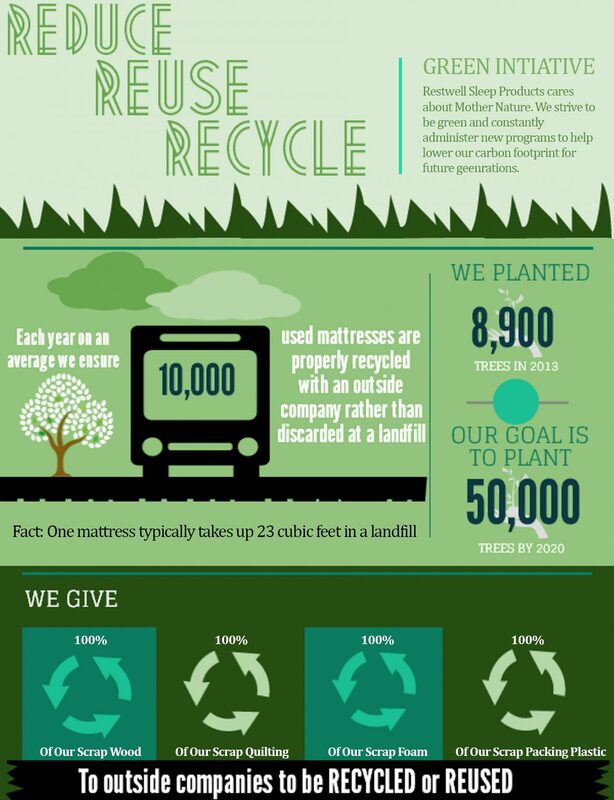 Restwell is proud to be an extremely social and community-minded mattress manufacturer. From our humble beginnings in a garage in 1990, our company’s culture has always been about creating shared success, while maximizing our positive community impact and minimizing our global carbon footprint. Everything we do at our head office in Vancouver, BC, as well as in our dealers across Western Canada, is about giving back to the community that has given us so much, as well as supporting charities that help our community thrive. In this day and age of mass production and mass consumption it is hard to find companies which take part in green initiatives and have a strong commitment to the environment; however, here at Restwell Sleep Products we have existing green practices and products that embody who we are as a company. Restwell aggressively administers recycling programs whether it is in the corporate office or down on the manufacturing floor. We recycle 100% of our scrap cardboard, plastic, and wood which in turn eliminates the overwhelming amount of waste which consumes our ecosystem. In addition, all excess foam, fabric, and fiber from our quilting machines are compressed and turned into a variety of new goods such as pillows and dog beds. The Restwell culture revolves around family, responsibility and community involvement. Everything we do and strive to do is about creating a better environment for our customers and our customer’s customer. We truly believe we can foster a better world through our quality mattresses and unbelievable customer service. We do everything we can to act with integrity and high ethical values. We say what we mean and do as we say. We “walk with a purpose” and push ourselves to do it better and faster. Restwell manufactures all bedding to order through “just in time” production techniques which serve its dealers and customers more efficiently. Most bedding orders are scheduled, produced and shipped within 3 days of receipt with fast, friendly and reliable service on our dedicated trucking fleet. Restwell Sleep Products operates a state-of-the-art facility in Surrey B.C. This allows us to provide more efficient services throughout North America. Restwell manufactures all bedding, at its state-of-the-art facility in Surrey B.C., to order through “just in time” production techniques which serve its dealers and customers more efficiently. Most bedding orders are scheduled, produced and shipped within 3 days of receipt with fast, friendly and reliable service on our dedicated trucking fleet. Restwell Sleep Products is a boutique mattress manufacturer in Surrey, BC. We service both independent dealers and national retail chains in North America, as well as hundreds of corporate clients in Canada. With so many companies to service, we manufacture a diverse lineup of mattresses and bed foundations. These products range from super-luxury to cost-friendly, soft to firm, single to king, etc. Below is a quick explanation of the brands we manufacture, and how they differ from each other. A good night’s sleep shouldn’t be elusive. It’s one of, if not the most important thing you’ll do all day. Plus, as you’ve probably heard many times before, we spend nearly a third of our lives sleeping, so finding a great mattress to sleep on is key! Choosing to rest on a natural, organic mattress is making the best decision for your health and contributing to lessening the strain of plastic chemicals on our planet. In this day and age of mass production and mass consumption it is hard to find companies which take part in green initiatives and have a strong commitment to the environment; however, here at Restwell Sleep Products, we have existing green practices and products that embody who we are as a company.